Night three of protests in Atlanta became more confrontational. Police made at least ten arrests. The protest started on 17th street Saturday night. People chanted, "The people united, we'll never be divided" from the sidewalks. By 7:30, protesters had shut down the street near Atlanta Station. Georgia State Patrol officers blocked the entrance ramp onto the connector to keep protesters from entering the interstate. 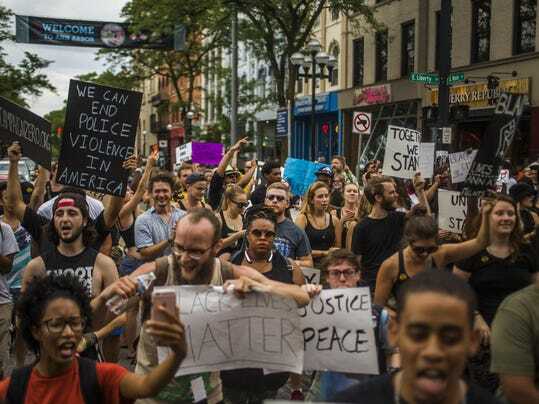 Hundreds of people marched through the streets of downtown Ann Arbor to protest police brutality and the deaths of black people at the hands of officers. Chicago Police Superintendent Eddie Johnson on Saturday relieved a third officer of his police powers in the death of a suspect after autopsy results showed the 18-year-old died of a gunshot wound to the back. Johnson's move came hours after the Cook County Medical Examiner's Office ruled Paul O'Neal's death a homicide. A third Chicago cop involved in the fatal shooting of an 18-year-old man Thursday night in South Shore has been “relieved of his police powers” by Supt. Eddie Johnson after an autopsy showed the dead man was shot in the back, a police spokesman said Saturday.